It’s the Intel review you’ve been waiting for. Today is the launch of the first two CPUs from Intel’s Skylake architecture, the 6th Generation Core i7-6700K and the Core i5-6600K. With the new processors we get a new architecture, a new socket, the move to DDR4 and the potential to increase both performance and efficiency at the same time. A lot of readers have asked the question – is it time to upgrade? We had a CPU or two in to test to answer that question. For those in the industry, predicting Skylake’s launch has been a minefield. Even at Computex in June, some companies were discussing a large six-week window in which they expected Skylake but were waiting on official dates. But as we've seen with a number of previous Intel mainstream launches, Intel likes to aim at the gaming crowds release at a gaming events. It just so happens that today is Gamescom in Germany, two weeks before what everyone expected would be a launch at Intel’s Developer Forum in mid-August. Today is a full launch for the Skylake-K processors, with the two CPUs being launched alongside new Z170 series motherboards and dual channel DDR4 memory kits. Having spoken to a few retailers, they have stock ready to go today. That being said, a number of them would have liked more stock on launch day, suggesting that they expect the processors to sell out rather quickly when the buy buttons are activated. All the motherboard manufacturers should be ready to go as well – take a look at our breakdown of the retail motherboard information we could get before launch for a good overview of what to expect this generation. DDR4 manufacturers have been selling the new standard of memory for over a year due to Intel’s high-end X99 platform supporting it, but today will see the introduction of dual channel kits to go with the Skylake platform as well as a number of higher speed modules ready and waiting. ‘Where are the non-K processors? !’ you may ask. Intel tells us that these will be released later in the year, sometime in Q3. As a result, we have to wait and see what range of models come out at that point and we will get a number in to review. To go with the launch is a new look of Intel's Core processor packaging, in part to appeal to the gaming crowd. As the gaming industry is considered one of the few remaining areas for potentially large growth in the PC industry, Intel is increasing its focus on gaming as a result. 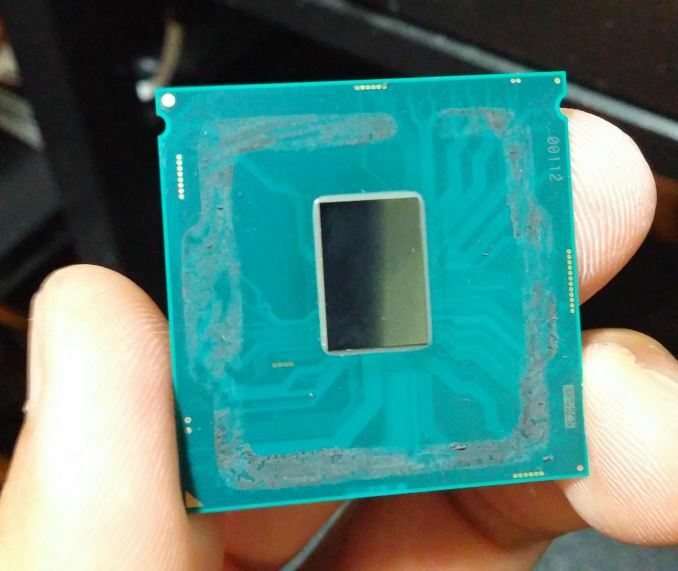 Aside from changing the graphics on the box, it has been reported – and seemingly confirmed by the thinner boxes in the official pictures from Intel – that these processors will not be shipped with a stock Intel cooler. Users will have to purchase third party coolers. Part of this makes sense – overclocking processors need beefier cooling in order to extract the maximum overclock and buying something above the stock cooler should be good. The downside of not having a stock cooler means an added cost to the end user. However as the hole mounting for the new socket, LGA1151, is similar to that of LGA1150/1155/1156 – spacing is still 75mm – many existing CPU coolers for the current LGA115x sockets should be compatible, making it possible to reuse many coolers for no more than the cost of a new thermal paste application. For users looking for a new air or liquid cooler, head on over to our recent roundup of Top Tier CPU Air Coolers Q3 2015: 9-Way Roundup Review and the Closed Loop AIO Liquid Coolers: 14-way Mega Roundup Review published last year. Kaby Lake (link)? 14nm Tock 2016 ? Intel’s early issues with 14nm yields have been well documented and we won’t go into them here, but 14nm is a more expensive process with an increased number of lithography steps as we reach the limits of current semiconductor technology. FinFET was introduced back in 22nm, but to move down to 10nm makes either the current process more expensive or other methods have to be used. As a result, we see Moore’s Law stretching out from an 18-24 month cadence to a 24-30 month cadence for the first time in fifty years. As we’ve seen with the graphics card market recently stalling at 28nm, there is a need (or at least opportunity) to develop more power efficient architectures rather than just relying on die shrinks to do it for you. Future development aside, today Skylake will hit the shelves in the form of two overclockable processors, the Core i7-6700K and the Core i5-6600K. As with previous nomenclature, the i7 model will be quad core CPU with HyperThreading and 8MB of L3 cache. This matches up with the Haswell parts to which Skylake is more closely aligned (Desktop Broadwell is rather a blip, using an external on-package eDRAM and you can read our review here), in a large number of aspects including the other cache levels. 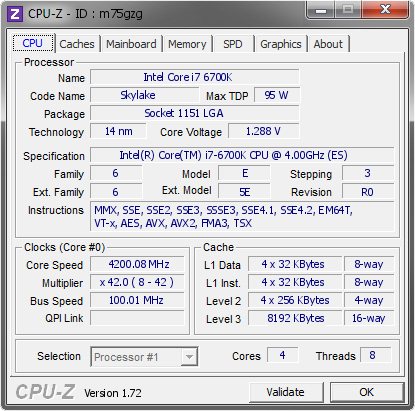 The 6700K runs at a base frequency of 4.0 GHz and an all-core frequency of 4.2 GHz. This is a slight speed bump over the 4770K which was launched at the start of Haswell, but a minor reduction in clockspeeds compared to the i7-4790K, which was an upgraded Haswell part launched later under the name of ‘Devil’s Canyon’. The integrated graphics nomenclature has changed, with the new i7-6700K having the Intel HD 530 graphics, compared to the HD4600 in the Haswell parts. We know that the HD 530, like the HD 4600, has 24 of Intel’s execution units in the iGPU, and they run at a peak frequency of 1150 MHz. The introduction of the HD 530 marks the launch of Intel’s 9th generation graphics, and we'll cover Gen9 in a bit more detail later. iGPU Freq. 1200MHz 1100MHz 1150MHz ? The i5 model for Skylake also has quad cores, but without HyperThreading and only 6MB of L3 cache. 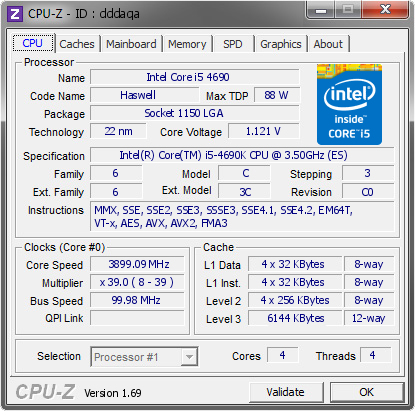 Like the i7, it also has the Intel HD 530 graphics but operates at a lower frequency band. Both the Skylake processors will support DDR4 and DDR3L memory in order to ease the transition to DDR4 for the mainstream segment, although it should be said that DDR3L is implemented here due to its lower than standard DDR3 operating voltage of 1.35 volts. This more closely aligns with DDR4’s standard voltage of 1.20 volts or the high end DDR4 kits at 1.35 volts, and as a result we are told that motherboards that support DDR3L will typically only be qualified to run DDR3L kits, rather than DDR3 kits. This leads onto the point that both of the K processors for Skylake sit at 91W, which is a small increase over Haswell at 84W and Devil’s Canyon at 88W. In the past Intel has historically run a 1:1 policy whereby a 1% performance gain must come at a maximum of a 1% power penalty – this was adjust to 2:1 for Broadwell, and we should assume that Skylake had similar requirements during the planning stage. Depending on the specific architecture details, one potential source for this increase in power consumption may be the dual memory controller design, although Skylake has a significant number of features to differentiate itself from Haswell. But you wouldn't want that to happen since you love how much Intel are milking their customers right?